Many forecasters, in and out of government, see severe limits to US economic growth in coming years and an inflation threat even sooner. A tight labor market, they claim, is the key reason. The Fed is thoroughly convinced that the headline unemployment rate, now 4.2%, is so low that it will soon spawn significant wage inflation that, if left unchecked, will spread throughout the economy. The central bankers fervently believe in the theoretical Phillips Curve that holds that the lower the unemployment rate, the higher the inflation rate. They seem oblivious to the reality that both the unemployment rate and inflation have been falling in recent years. 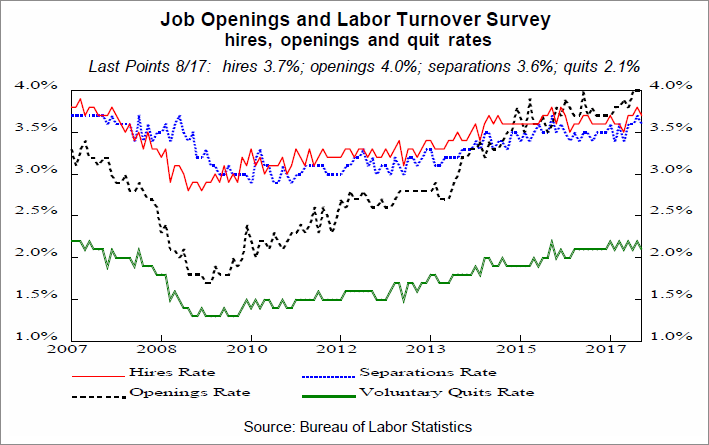 Nevertheless, the Fed and others see the rising number of job openings while the hiring rate remains flat as clear evidence of a tight job market. In contrast, we continue to believe that employers remain cautious over new hires as they fret about not being able to pass on their additional costs in higher prices. Employees are also subdued, as demonstrated by the voluntary quit rate that has risen only modestly in this business recovery. Memories of joblessness in the Great Recession are still vivid for many as is the understanding that those who quit in hopes of a better-paying job may not succeed. Also, the threat of being replaced by a robot or being outsourced encourages many employees to stay put. As noted in past Insights, however, Trump can, in coming months, appoint four of the seven Fed Governors, including the Chairman. Given his disdain for economists, many of whom now populate the Fed, that body may be transformed to one with a more realistic, businesslike approach. In contrast to the current line-up of central bank officials, some of the potential new appointees may have met payrolls in their earlier business careers. With retiring postwar babies, many believe the prime US workforce ages 25-to-54 will only grow 0.5% annually for the next decade. 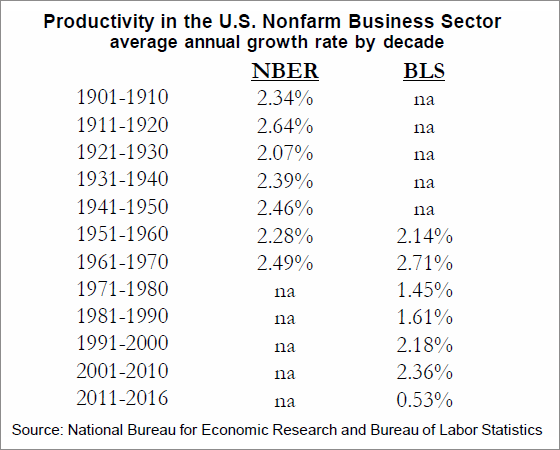 They also believe productivity will rise at a subpar 1.3% per year—but still above the 0.53% rate so far in this decade. So the combination of the two will result in only 1.8% real annual GDP advances. As we’ve discussed at length in past reports (see “Doubling Down on Deflationary Forces,” October 2017 Insight), the US labor market has a lot more slack than the headline unemployment rate suggests or the Fed believes. That provides clear reasons why wages remain restrained. First and foremost is globalization, the shift of manufacturing and other production in the last three decades from developed countries in Europe and North America to developing economies in Asia, where costs are much lower. The resulting collapse in manufacturing employment in the West has been dramatic, as shown by the decline in jobs and as a percentage of total nonfarm payrolls. To read the rest of Gary Shilling's November INSIGHT newsletter, click here for subscription information. Each issue includes an extensive overview of the economy...exhaustive investigations of key economic indicators and how they affect your investment portfolio...detailed examinations of emerging business and financial trends that could spell opportunity or danger to you and your investments...our investment themes...a wrap-up of recent economic data...and Gary Shilling’s back-page Commentary on matters great and small. You can also follow Gary on Twitter @agaryshilling.